Anyone who has ever traveled to Southern Spain, Turkey, North Africa or Middle East knows that the food is quite magical. Food from these regions generally contain an array of fresh spices abound in flavor such as saffron, cumin, ginger, paprika, black pepper, cinnamon, mint and garlic. Mouthwatering fresh fruits such figs, dates, oranges and pomegranates can often be found added to freshly prepared tagines and couscous. Delectable olives, delightful almonds and mouth-burning harissa (a capsicum-pepper sauce which I adore) make any meal legendary. 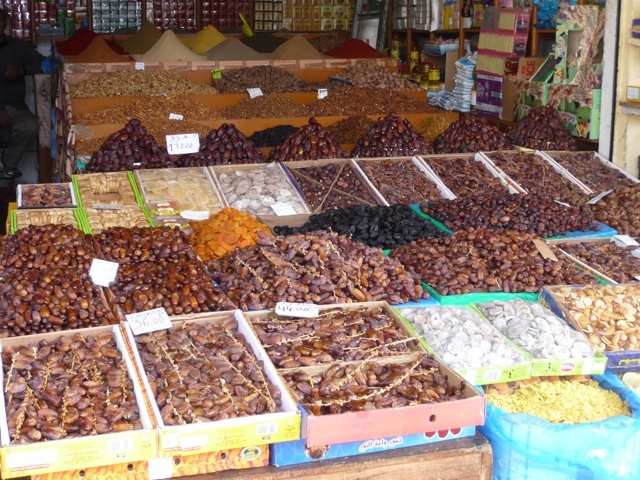 The warm, gentle climate of Morocco provides an abundance of fresh vegetables as well (such as pepper, beans, tomatoes, artichokes, eggplants, onions, beets and pumpkins) which are common side and main dishes throughout Morocco. 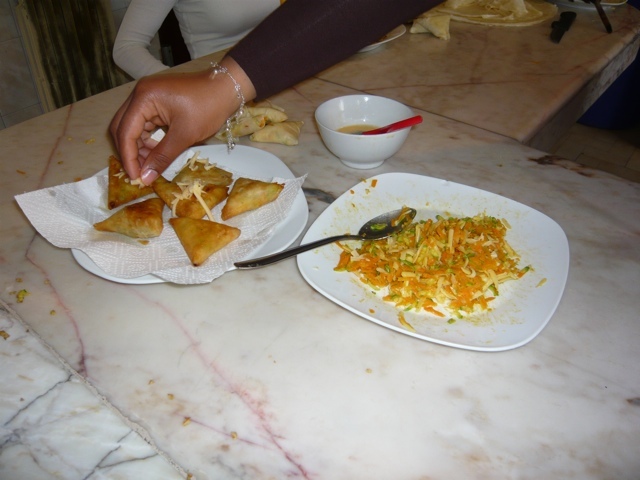 Being a world cuisine lover, I found Morocco to be a culinary paradise and was not once the slightest bit disappointed in the fantastic, fresh, exciting and worldly food I found. 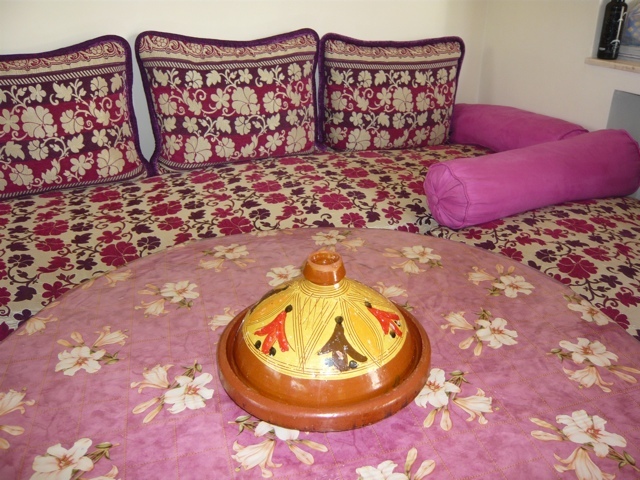 My first night in Morocco was spent at a gorgeous Riad (see earlier posts) which served my first true Moroccan tagine, the famous Moroccan stews containing chicken or lamb with an assortment of fresh vegetables and spices that are cooked in a conical earthenware pot creating a lovely, tender and moist stew. 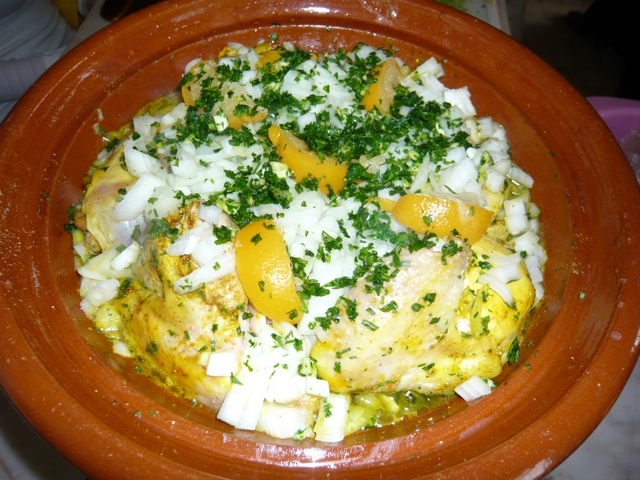 I chose the chicken tagine with almonds and lemon over my beloved couscous (a type of semolina, small circular rice that is also served usually with a stew). After eating detestable plane food for the last twenty-four hours, my first Moroccan meal felt like heaven. I was also surprised to learn that Morocco, an Islamic country (over 99% Muslim) produces fantastic local wine. I ordered a half-bottle of Moroccan red which was delicious: Full-bodied, bright, with a smooth finish. I went to sleep after hours of travel feeling happy and full, anxiously anticipating my next Moroccan meal. My visit through the local souq showed me exactly where these fresh, delightful ingredients come from. Vendor after vendor sold spices in all colors and flavors by the bag, and olives, nuts, figs, dates and fresh vegetables were at each and every corner of the market. 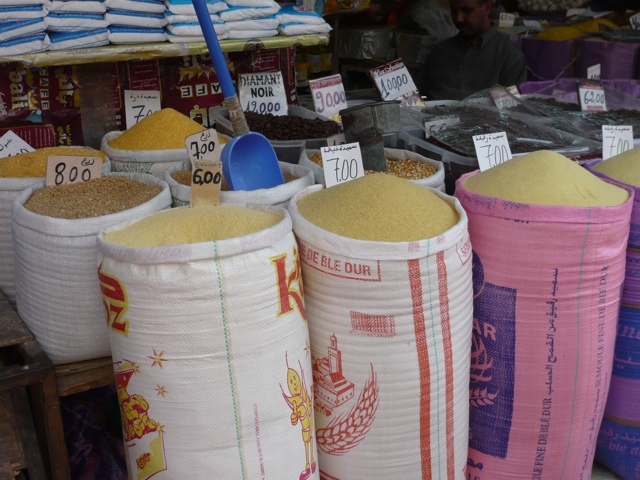 I could have spent hours and dirhams passing through the souq and sampling up everything they had to offer. 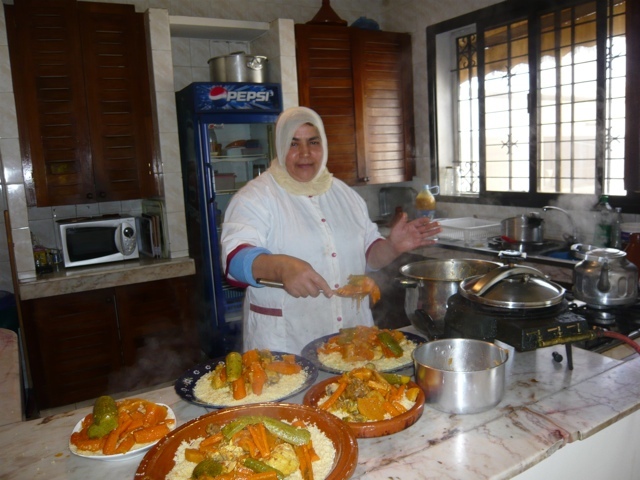 No wonder why Moroccans are such good cooks! In fact, each region and every city is known for its unique dishes and influences. This is probably not a surprise given that the distinctive flavors of Moroccan cooking come from a variety of origins such as Portuguese, Jewish, Spain, Persia, Senegal, France, Berber North Africa, Italy and Turkey—all countries that have ties to Morocco. 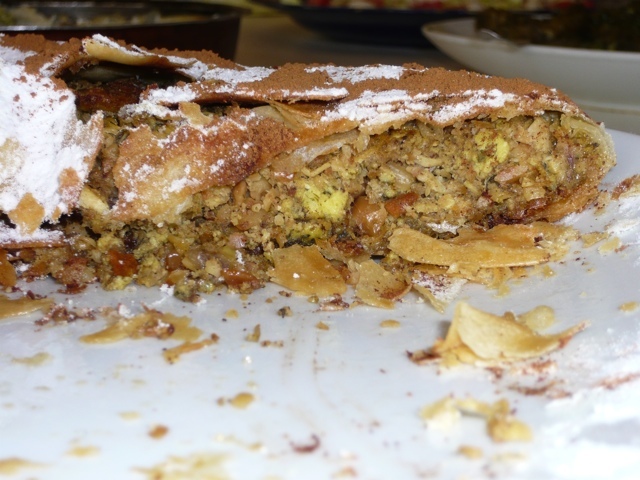 This gorgeous dish is called a bastilla. It is a multilayered pastry made out of phyllo dough and filled with a crushed mixture of toasted almonds, ground chicken, cheese and spices. 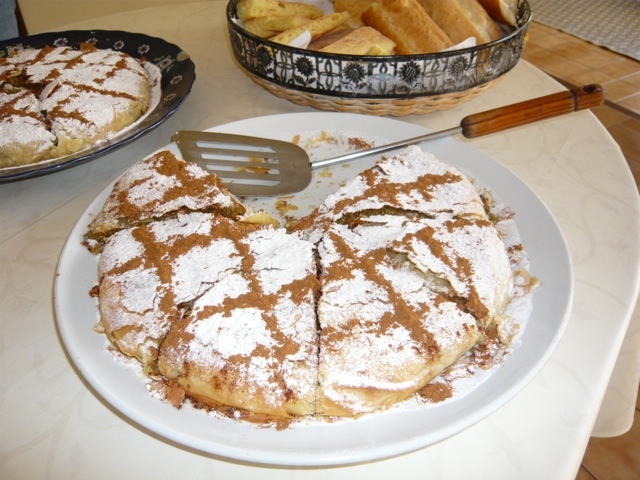 Finally, it is topped with a dollop of cinnamon to give it a dessert like taste and appearance. 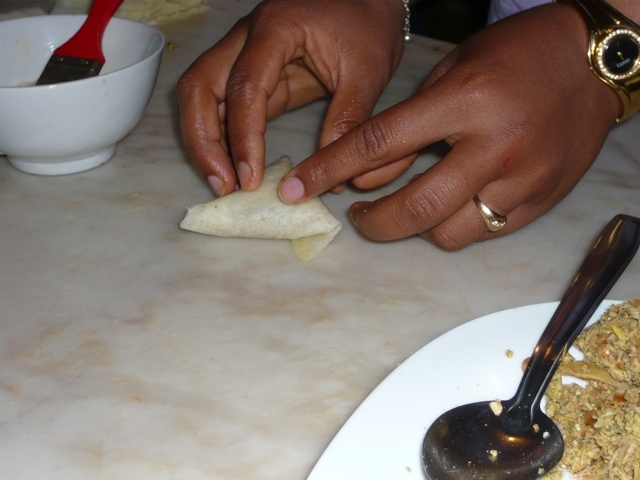 It takes hours to prepare and looks were by no means deceiving….It was incredible!!!! 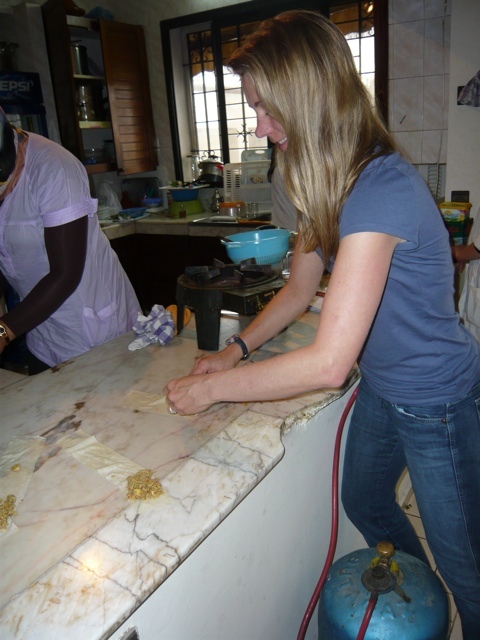 One of the highlights of my week stay in Morocco was our two-hour cooking class held by CCS at the Home Base. 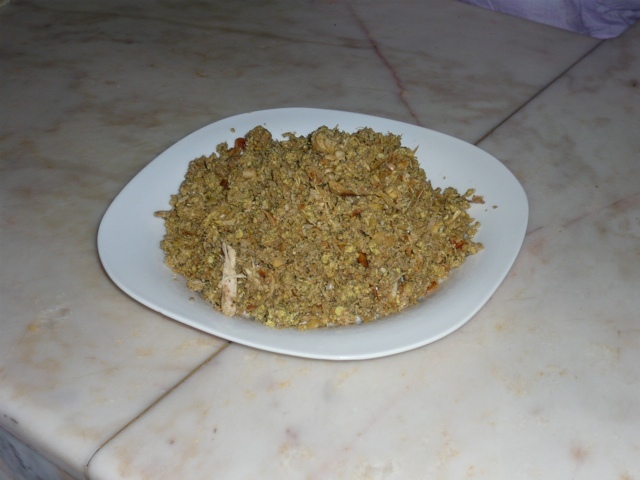 We learned how to make two main staples of Moroccan life: Moroccan Mint Teat and Chicken Tagine. Throughout Morocco, mint tea is a way and tradition of life. Moroccans, like many others around Asia and parts of Africa, love their tea and tea time is a sacred time in Morocco that cannot be denied. Usually tea time happens in the late afternoon from 4-6 PM however tea time can happen anytime in Morocco, and to be invited to tea is a big honor. 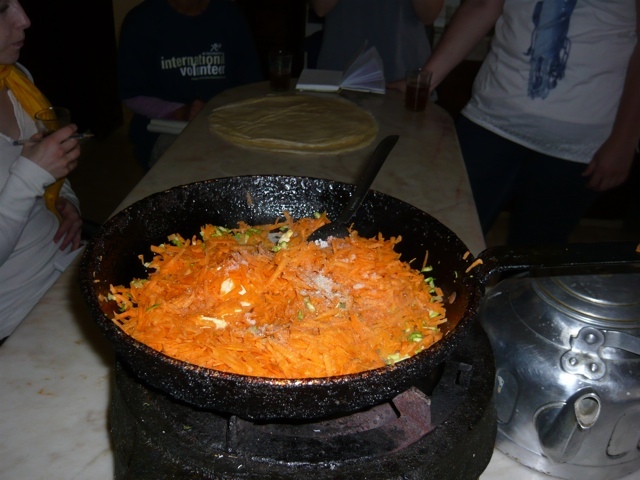 Throughout the day, we could see Moroccans have traditional tea in the medina, in the souq, in the CCS Home Base and at our volunteer placements. Outdoor cafes serve tea as well however it usually isn’t the labor and love-intensive home-made Moroccan Green Mint Tea. When boiling, pour the hot water into the tea pot, rinse and dump out. This warms up the pot. Add two tablespoons of Green tea into the hot pot. Pour a cup of hot water into the pot and let stand for one to two minutes. Don’t shake the mixture, and pour it out into a cup. This is the soul of the tea. Add another cup of hot water to the tea pot and shake. Pour the contents into another cup. You will notice that the tea is a different color (this is because the tea leaves open and may have some dust or dirt on them, so you shake the leaves to get rid of the “bad stuff”). You take all the poured cup(s) of this tea and dump it out into the sink. Next, you go back to “the soul of the tea” which is the spare, original tea that was not mixed and poured into a reserve cup. You pour the cup of tea into the teapot and fill with more water, leaving some space on top for the fresh mint and basil. Bring to a boil. After boiling, you add a handful of fresh mint and basil, then add a lot (Moroccans like their mint tea very sweet!) of sugar, perhaps 4-5 larges tablespoons. To mix, pour the cups into tea glasses and then pour the contents once again back into the tea pot. You do this 4-5 times (no joke!). Finally, the tea is ready to serve. 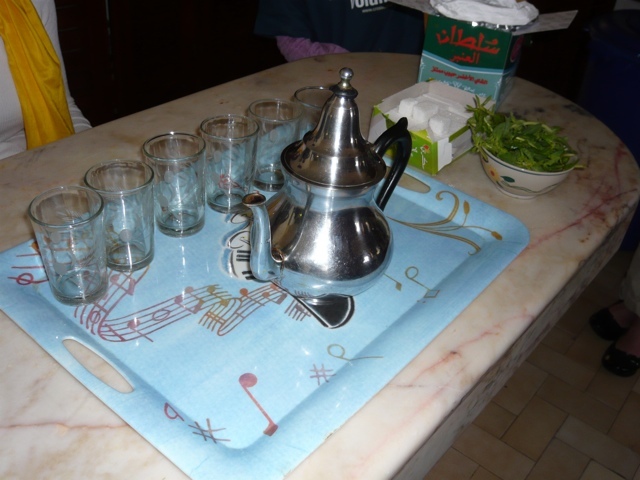 You pour the finished product into glasses (not mugs) as the Moroccans prefer and get ready to sweeten up your mouth! Enjoy! Note: It is best to have a traditional tagine earthenware pot to make this but I am sure you can improvise with a large saucepan and tight-fitting lid (yet may want to leave a crack open while it is cooking). Add 1/2 teaspoon of salt along with 8 pieces of chicken parts (@ a whole chicken). Chop a fist-full of fresh cilantro along with two to three cloves of fresh garlic. Flip the food and then add the other half of chopped onion on top of the tagine ingredients (you want one half of the onion to cook underneath the meat). Add another heaping tablespoon of the cilantro and garlic mix. Last step: Add one cup of water to the mixture; cover the tagine and let boil. Then turn to low heat and simmer for 45 minutes. ENJOY!!!!! *You can either buy preserved lemon or make it yourself. To make it yourself: Cut one lemon into fourths. Add salt into each lemon section. Preserve pieces of lemon in a closed jar for two weeks at room temperature and shake every other day. When ready, take seeds out and place small pieces with rinds inside the tagine. I was so impressed with my newfound knowledge and with the delicious taste of the tagine, that I actually went on a mission to buy a real clay tagine the day before leaving Morocco. I have no idea what on earth I was thinking. Tagines are fragile and cumbersome. Not something you want to try to carry back on multiple international flights. But I was a woman on a mission. I had to have one! 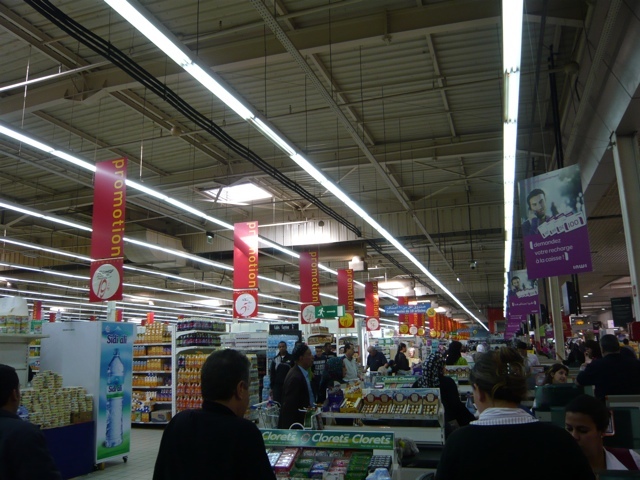 With little time left in Morocco, I opted to hit the nearest shopping mall, a place called Margene, which unbelievably enough contained what I call a Moroccan version of Costco warehouse. I walked in and the place was packed with local Moroccans going about their shopping. There I was, of course the only blond-haired woman, searching for deals and salivating once I found them. I found my tagine, for $15 as well as a boatload of Moroccan spices such as cumin, ginger, saffron, etc. All for the meager price of $1 per enormous year-long-lasting bag! I stocked up knowing that even Target charges the outrageous price of $10 for a tiny bottle of two-use saffron. If I could have filled my entire suitcase with spices, I’m sure I would have done it (yet I probably also would have (a) smelled up my suitcase to beyond repair (b) got busted at customs for it. 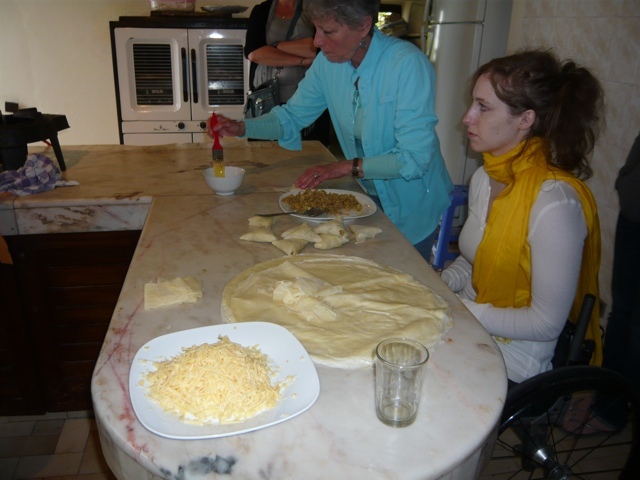 Our final Moroccan Cooking 101 experiment was to make those delicious deadly pastries: Phyllo dough, filled with either the crushed almond, cheese, chicken mixture OR carrots, garlic and cheese, OR feta cheese and spinach mixture. 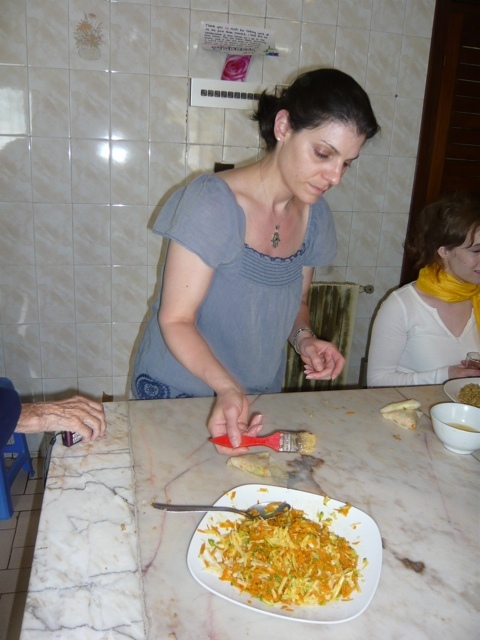 Here is another one with over 370 recipes….alas…if only I had the time! 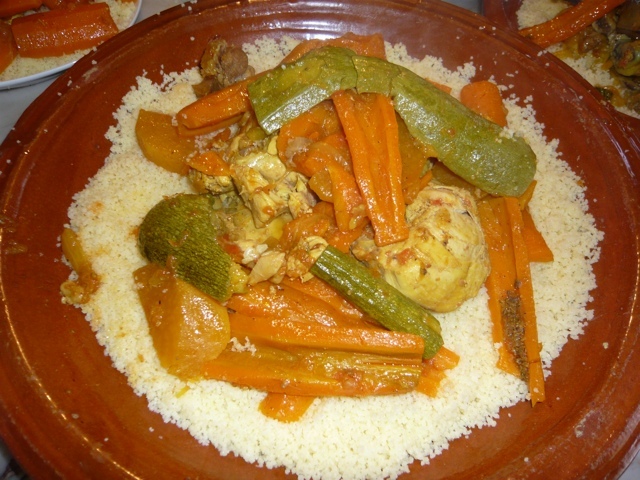 Finally, if all else fails….find a good local Moroccan restaurant and eat without the work! Coming Next…..I want to wrap up my week in Morocco with a post on my visit to the ruins and one on Morocco today. Stay posted! Love this post and the mouthwatering pics! Looks like you had a truly gastronomic experience. Now I’m going to have to try and make a tagine! I’m getting hungry just looking at the pictures. great blog. thanks for sharing. 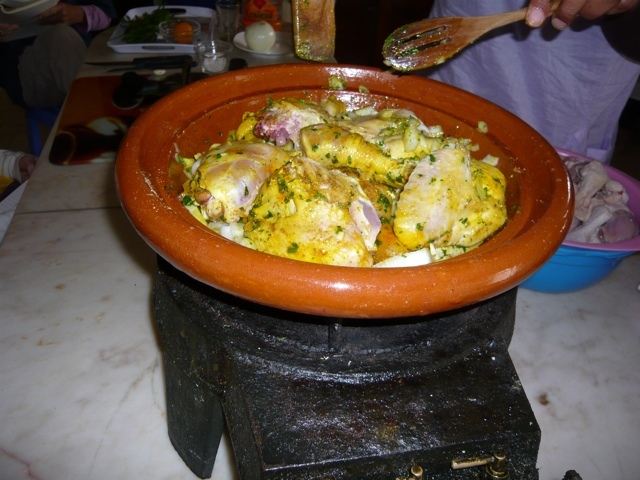 Terrific post, it was if I was there enjoying the tajine. Sounds like a fantastic trip. 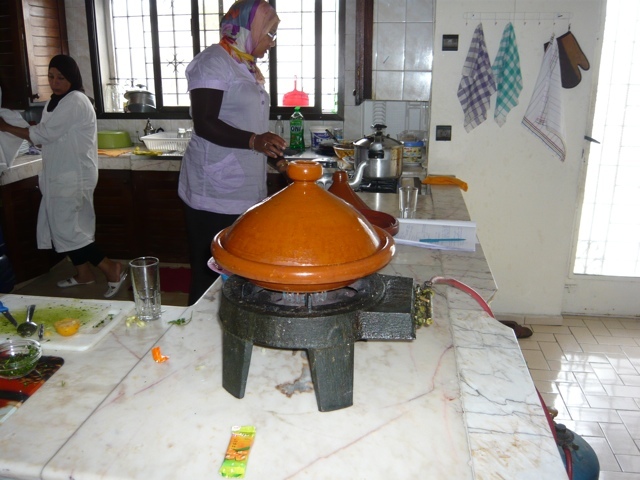 Love cooking tajines myself and actually everything about Morocco, I’ll get there one day. Really looking forward to your next posts. Thanks! 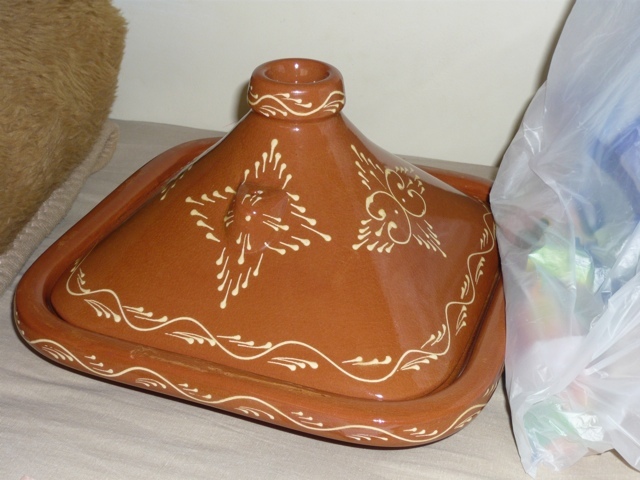 I’ll be honest that the tagine I bought is still sitting there in the corner of my bedroom! I haven’t made it yet. Mostly because I have two young kids who are picky eaters and I am also waiting for it to cool down here! When I do finally get around to making that darn tagine, I’m sure to post about it! Thanks for reading! Great post, all of them are, really! Tagine is one of those things that show how good you are at cooking in Morocco; if you can ace a tagine you are a certified cook no Cordon Bleu degrees needed 🙂 I have a tagine 101 post in my blog do check it out!! Thanks! I will have to go check it out. My Tagine is still sitting in my closet gathering dust after two years. I really need to take it out!!! !